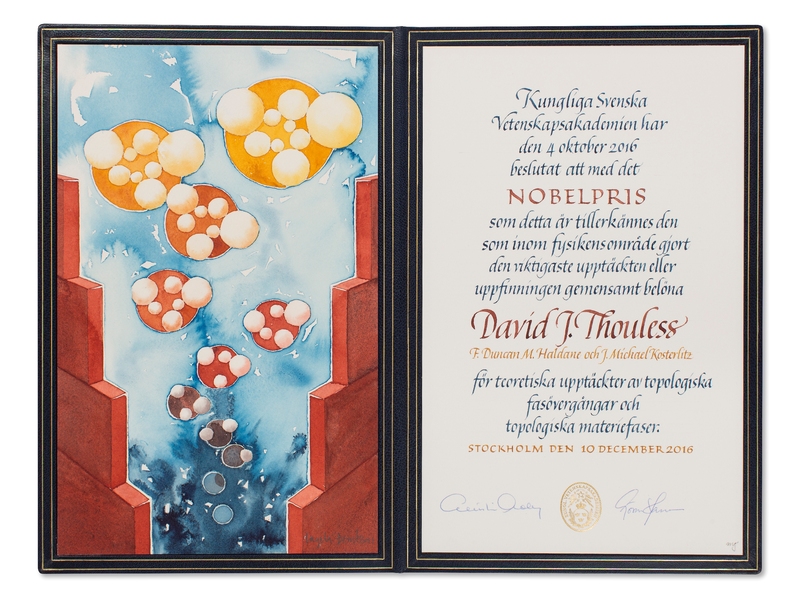 Days of festivities for the 2016 Nobel Prizes culminated on Dec. 10 with an award ceremony and banquet in Stockholm hosted by the Nobel Foundation and the Swedish Royal Family. On stage at Stockholm Concert Hall before an audience of dignitaries and guests, David James Thouless, University of Washington professor emeritus of physics, received the Nobel Prize in Physics from King Carl XVI Gustaf of Sweden. 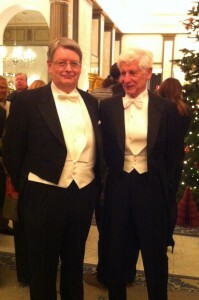 Half of this year’s physics prize went to Thouless, with the other half shared between professors J. Michael Kosterlitz of Brown University and F. Duncan M. Haldane of Princeton University. The three received the prize “for theoretical discoveries of topological phase transitions and topological phases of matter,” according to the Oct. 4 prize announcement. At the Dec. 10 event, Professor Thors Hans Hansson of Stockholm University and the Royal Swedish Academy of Sciences presented Thouless, Kosterlitz and Haldane to the assembly. 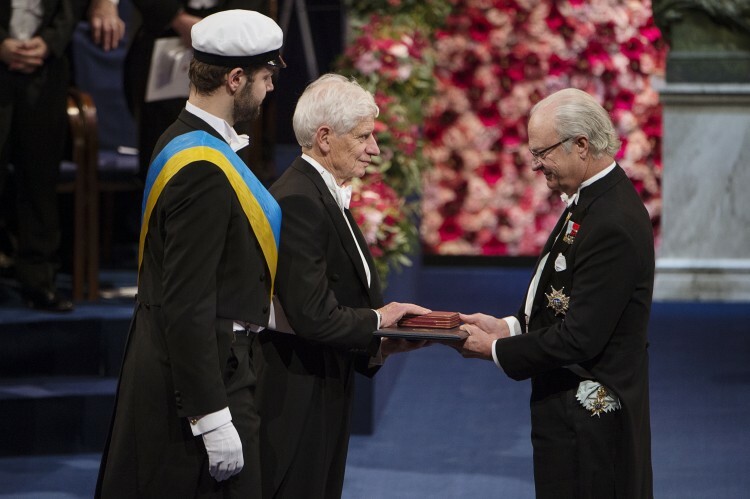 Concluding that the laureates’ contributions represent “theoretical physics at its best,” Hansson invited each to come forward and receive a Nobel medal and diploma from the king. Thouless led the way. As a professor at the University of Birmingham in the 1970s, Thouless began to explore the unique properties of matter that become exposed in flat, two-dimensional environments. This type of work continued when Thouless joined the UW faculty in 1980, working closely with three postdoctoral researchers, including Marcel Den Nijs, who is now a UW professor of physics. Ultimately, they were able to describe the “exotic” properties of matter in these “flatlands” using topological methods — a branch of mathematics that describes properties which change in a stepwise manner. These were complex undertakings, and in a Nov. 30 interview with Smithsonian Magazine Kosterlitz lauded Thouless for his ability to “understand the contradictions, and puzzle them out.” They upended existing ideas on the behavior of matter in the flatlands. Their theories and practices form the basis of today’s scientific quests for new materials with exotic properties. 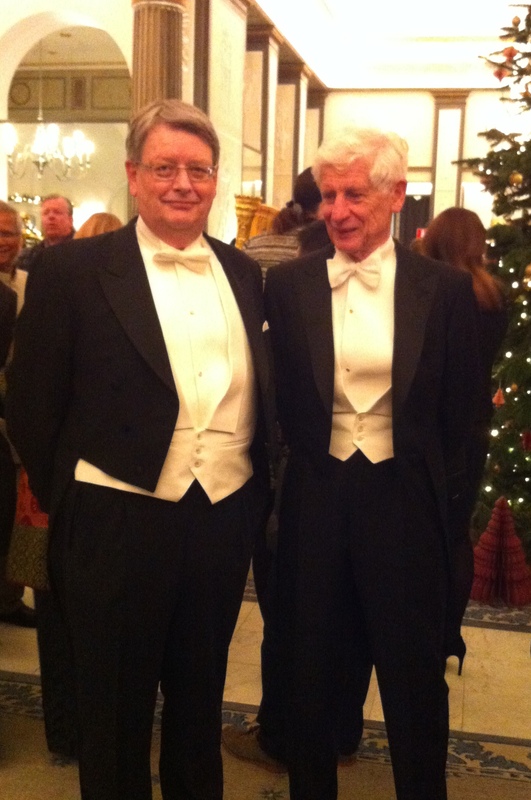 Events of Nobel Week also included public lectures on the discoveries that were made this year’s laureates. Speaking before two such presentations on the physics prize, Hansson described Thouless as “a legendary person” who has made contributions to theoretical physics and mathematics even beyond the work cited by this year’s prize announcement. Thouless’ contributions to intermediate-scale physics and quantum mechanics — or mesoscopic physics — “might be as important as the work that we are celebrating today,” Hansson said. Thouless retired from the UW in 2003. He resides in the United Kingdom with his wife, Margaret Thouless, who was a UW associate professor of pathobiology.